The Giant Otter Conversation Authoring Platform is a powerful solution for building bots bottom-up. The unique human-in-the-loop algorithm at its core is designed to be scalable, flexible and efficient -- enabling you to construct a robust model of any conversation from small numbers of examples without any special expertise in bots, language, or even the topic of the conversation. The full platform is available to subscribers, but for companies that want to move more quickly, our Conversation Modeling service lets you tap into a pool of trained annotators, managed by platform experts at Giant Otter. Our annotators can process thousands of conversation examples in days and extract the intents, entities, dialogs (and examples thereof) that you need to build a great bot. Upload example conversations today, and you can be Shaping and Testing your bot by next week. 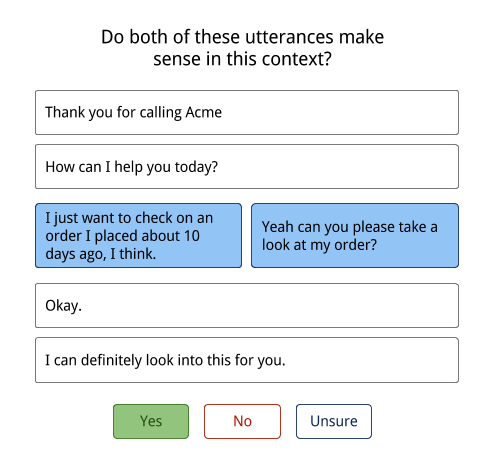 If you don't have conversation data to cover all of the intents and dialogs your bot needs to handle, our Data Generation services can help you to fill in the gaps. Upload your data - connect data sources via our secure API or send batches directly. Describe the purpose of your bot. Set the the task specs and identify any special project requirements. Then, launch it! Giant Otter generates annotation tasks and sources workers to match the project requirements. Tasks are assigned to workers to meet quality and speed objectives. Our algorithms check the results, and you get an alert then they're ready. Review your model in the Shape section of the Conversation Authoring Platform. If you had an existing model, new elements (intents, entities, dialogs, etc.) and examples will be highlighted for you.